Akhilesh Yadav, Mayawati, Mamata Banerjee were among top opposition leaders who gave the swearing-in ceremonies a miss. New Delhi: The very idea of a grand opposition alliance seems to have suffered a blow, a day after some regional parties declared Congress president Rahul Gandhi as the opposition’s PM candidate in 2019 — following the party’s impressive electoral show in the Hindi heartland. At the swearing-in ceremonies of Congress chief ministers — Ashok Gehlot in Rajasthan, Kamal Nath in Madhya Pradesh and Bhupesh Baghel in Chhattisgarh — there was a discernible cleft in opposition ‘unity’, with some top leaders choosing to stay away. Those who gave the ceremonies a miss were chiefs of big regional parties — Samajwadi Party’s Akhilesh Yadav, Bahujan Samaj Party’s Mayawati, Trinamool Congress’ Mamata Banerjee and Biju Janata Dal’s Naveen Patnaik. Also absent was Delhi Chief Minister and Aam Aadmi Party (AAP) leader Arvind Kejriwal. Contrast this with the image around seven months ago when the swearing in of H.D. Kumaraswamy as Karnataka CM in May became a stage to showcase a determined and united opposition. Rivals in respective states’ bitter politics came together. So if Mayawati and Yadav shared stage, so did Banerjee and Left leaders such as Sitaram Yechury and Pinarayi Vijayan. Kejriwal, albeit a bit aloof and seemingly reluctant to be at the forefront, also stood alongside other opposition leaders. Cut to December, and the situation seems more fluid as attempts to bring together a united opposition appear clumsy. Top leaders from the opposition who attended Monday’s oath-taking ceremonies included Nationalist Congress Party (NCP) chief Sharad Pawar, Karnataka CM and Janata Dal (S) leader Kumaraswamy, Andhra Pradesh CM and Telugu Desam Party’s N. Chandrababu Naidu, DMK leaders M.K. Stalin and Kanimozhi, former Jammu and Kashmir CM and National Conference’s Farooq Abdullah, former Prime Minister and JD(S) chief H.D. Deve Gowda, Bihar’s Sharad Yadav, Jharkhand Mukti Morcha’s Hemant Soren and Rashtriya Janata Dal’s Tejashwi Yadav. On Sunday, DMK chief Stalin proposed Rahul Gandhi’s name as the prime ministerial candidate for the 2019 Lok Sabha elections at a rally in Chennai — something that came as a bit of a surprise for several opposition parties, which believe the decision should be taken after results based on the numbers in the Lok Sabha, and whose leaders themselves harbour national ambitions. The SP and BSP have talked about their intent of fighting the Lok Sabha polls together — crucial given Uttar Pradesh sends 80 seats and this is where the BJP made its maximum gains in 2014. However, a degree of acrimony has crept into their equations with the Congress, with the latter refusing to accommodate them on their terms in the just concluded state polls. Moreover, the talks over how many seats to cede to the Congress in Uttar Pradesh in 2019 also seems to be a bone of contention. Mayawati’s absence is particularly telling given she did help the Congress when it fell just short of a majority in both Madhya Pradesh and Rajasthan. West Bengal CM Banerjee knows she is an important cog in the opposition’s machinery, with West Bengal sending as many as 42 MPs to the Lok Sabha, of which she won a lion’s share of 34 seats in 2014. This was just 10 less than the 44 the Congress managed to win across the country. The feisty leader has national ambitions of her own and is unlikely to agree to operate under the shadow of the Congress. Odisha CM Patnaik, meanwhile, keeps his cards close to his chest. He does not attend opposition meetings or rallies, does not let on whom he will support if needed and consistently reaffirms his party will remain equidistant from both political poles. Delhi has significant Sikh voters and the AAP has a stake in Punjab as well. 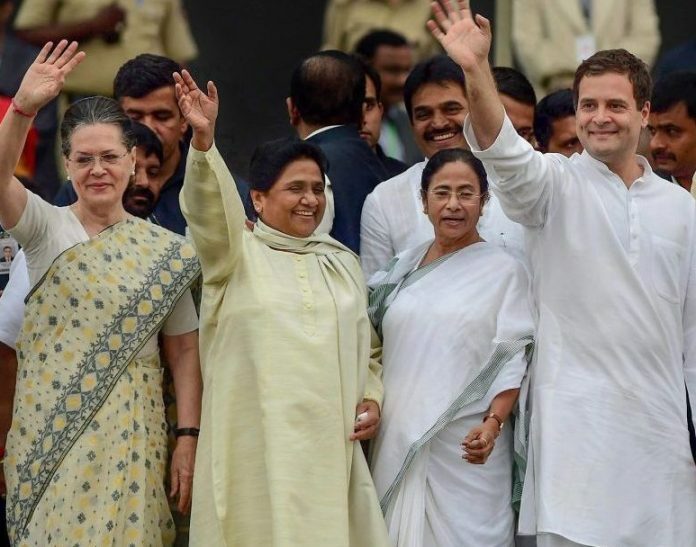 While a swearing-in ceremony earlier this year turned into a glorious show of unity among opposition parties, giving a push to the mahagathbandhan, the ones Monday ended up exposing the disagreements within opposition parties. I do not know objective behind the TRAI’s new proposals about pricing of TV channels. But as I see it, consumers will not get relief in terms of monthly charges or even a real choice to pick and choose their channels, as pricing of channels will be tricky. I think whole objective of TRAL will be defeated. Several regional leaders aspire to be PM. None will have even forty MPs next year. Shri Sharad Pawar may barely make it to double digits. Ms. Banerjee will have the largest contingent, but the DMK – whose leader sort of preempted the inevitable today – could be close to thirty. Each of them is thinking in terms of a V P Singh or a Deve Gowda model, where regional parties formed the government and received external support from a national party. The much better performance of coalitions between 1998 and 2014 was made possible by a national party being at the head. That laid to rest India’s fears of a “ khichdi “. At the moment, the sensible option would be to avoid the opposition vote being split. A chastened Mayawatiji tying up with the SP in UP is the one substantive piece of the jigsaw puzzle that is important. This is bound to happen when Congress just adds up the numbers and assumes that they will all click. But, 2+2 never won polls. CHEMISTRY, rather than ARITHMETIC wins polls. And Rahul has NO chemistry with ANY opposition leader, not even with Stalin, for all Stalin’s crowning Rahul prematurely.